1. 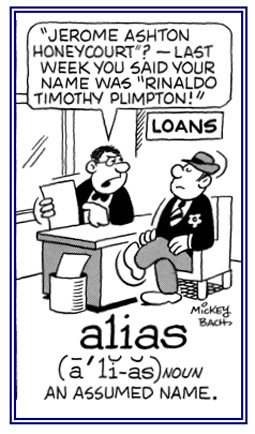 An assumed or false name used to conceal one's identity: The criminal was known by various aliases. To keep the police off his tracks, the criminal assumed an alias whenever he moved to live in another place. 2. At another time; in another place; in other circumstances; otherwise: In the alias of the last century, Mr. Smith was known as Lord J. C. Wigglebottom. 3. In the field of electronics, a misleading electronic signal that is technologically generated: The computer expert recognized the aliases and was able to modify the program to overcome the difficulties. © ALL rights are reserved.